I’m totally taking over my husband’s desktop for his shop so I can do a quick bumpdate. I’m kicking myself for not documenting as much in the last few weeks, but I will try to do better until the babies come! Due Date: We just tell people the babies will be here in December. Our due date has been bumped up to January 11th and 12th, which is only 2 days sooner than originally expected. No matter what, my doctor will not let me go past 38 weeks, so R&A will be here no later than December 31st! At our last appointment, Ryker weighed 1lb3oz and Averlee weighed 1lb4oz. Weight Gain: I am up 28 lbs since before my last FSH cycle. I have tried SO hard to be sure my weight gain is gradual and that I stick to somewhat of an exercise routine. I know I can lower my risk for gestational diabetes by doing so. I also know it will be easier for me to recover from labor and delivery if I stay on a healthy weight gain path. So far so good. Don’t get me wrong though…I have not been an angel when it comes to resisting unhealthy cravings! ha. 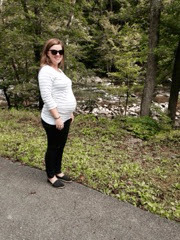 Maternity Clothes: It is all I wear! I’ve even graduated to maternity/ nursing bras. I never realized just how comfortable a bra without and underwire could be. HELLO! I’m loving my new bras from Motherhood Maternity. I have also been extremely blessed to have friends who have given me maternity clothes. 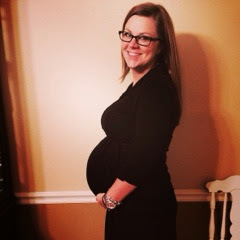 I cannot believe just how FAST I grew out of the stuff I stocked up on in the 1st trimester. Sleep: Other than waking up for bathroom breaks – which I’m doing with one eye open- I am sleeping pretty good! Best Moment This Week: Finishing our baby registry for our baby showers and finally assembling ALL of the nursery furniture! Weird Pregnancy Moment: I’ve had several stretch marks pop up in the last few days. Oh and the itching. My belly itches so much! Movement: Averlee usually gets going between 9-10am each morning. Her kicks and punches are a lot stronger than Ryker’s. I am assuming Ryker is just laying so low and maybe he is still hitting his placenta more than me. I do feel him move, just not as much as his silly sister. Cravings/ Aversions: Still drinking a lot of milk. Oh and THANK YOU to the makers of all things pumpkin spice! I am a fan of pumpkin spice stuff anyway, but apparently pregnancy has magnified that appreciation! What I’m Looking Forward To: Now that our registries are complete, I’m looking forward to our baby showers. I’m really excited to celebrate our little miracles with those who have hoped, prayed, and believed with us for the past 2 years! Two of my best friends are planning a shower for me in November, and I already know I will cry when I see a few faces walk in the door. Pinch me please. As of yesterday, we are 23 weeks pregnant. To celebrate, Averlee decided to throw a party in my ribs. I’m still debating if her brother was in on the fun. Determining which twin is kicking is a skill I have yet to master; however, at our ultrasound on Monday the tech showed me where Averlee’s head, back, and feet generally are. Yep. She is IN my ribs and laying sideways! Ryker is lower of course since he is Baby A. He is head down and his feet are just to the left of my belly button. Ryker is not quite as active as his sister, but that’s ok. Maybe he doesn’t have much room since his sister is all over the place constantly? We had our check-up and ultrasound on Monday. Everything looked great and we are still on track for a December delivery. My doctor is impressed with how well I have done so far. He also made a point to tell me I will get MUCH bigger than I currently am. He followed that up with a pep talk to remind me I’m still beautiful and for me to not worry about all of the weight gain. He told us the babies are measuring just a few days ahead. They weight 1lb3oz and 1lb4oz each. I cannot believe we could possibly be holding our babies in just over three months. It seems like our pregnancy has just flown by. We have managed to stay pretty busy getting things in order and ready for Ryker and Averlee’s arrival. The nursery furniture is.. almost.. put together…sorta. The cribs are assembled as well as the changing table. The glider and dresser are still in the boxes. Oops. I promise we will have everything assembled before my first baby shower! On another note, I have been keeping up with everyone via the bloglovin’ app on my phone; however, it sometimes will not let me comment. So if you feel like I have been missing in action lately, I haven’t. I’m still thinking and praying for each of you who are still awaiting your own miracles. My own infertility journey opened the door for me help a few ladies who I have been encouraging lately. I actually gave one of the girls my my fertility bracelet. I also gave her two of the books I read during my own journey. It brought tears to my eyes to see just how encouraged she was by me giving her such a small gift. Infertility is such a heartbreaking, emotional journey. Nobody should ever feel like they have to walk through it and feel alone. I’m so grateful God has placed these girls in my life for me to encourage just as I had women who encouraged me during my own infertility journey. Sorry if this post seems all over the place! I promise to be more organized next time! This will not be my typical Bump-date. In all honesty, I’m becoming a tad bit bored with writing those things anyway. I also feel like I’ve had a million and one other blog topics floating around in my head in the last few weeks. So here it goes. Two years ago, I never would have imagined my husband and I would have to fight a battle just to become pregnant. I definitely never would have imagined we would eventually conceive twins or that I would be able to carry them as long as I have. We are headed into week 23 of this miracle. I would be lying if I told you I’m not scared. I feel like this pregnancy is flying by, and the closer we get to the 33 mark… well the more anxious and worried I become. There are days when I wake up to huge, swollen legs and feet. It usually happens on Friday mornings. I immediately check my blood pressure like a crazy person just to give myself peace of mind that I’m not developing Pre-E. Don’t get me wrong. We are enjoying and loving our pregnancy. I love my growing belly and wiggly little Ryker and Averlee. I’m just SO terrified my body is about to say, “Well… we’ve made it this far. Time for them to come out.” I haven’t cut back on daily activities. I still work 8-9 hours per day. I still come home, do some housework, chase my 10 year old (when he’s with us), go to ballgames, go for walks, exercise, etc. I know my days are numbered. I know in a few short weeks, I will not be physically able to continue running around doing everything I currently do. I also know I prayed day in and day out for this time and it just seems to be flying by. The unknown scares me. I’ve caught myself worrying about what will happen if I do develop Pre-E again. *I had Pre-E with Gavin 11 years ago and had to deliver him via induction at 37 and a half weeks. * What if I end up in the hospital the last trimester of our pregnancy? What if the babies come before 36 weeks and we become parents of NICU babies? I tend to look at this pregnancy as half marathon training. That seems to be only other physically straining activity I have done in my 29 years. When I was training for my half marathons, I changed my eating habits. In this pregnancy. I have changed my eating habits in hopes I will not gain an excessive amount of weight and also to lower my risk for complications that go along with excessive weight gain in pregnancy. In half marathon training, I did exercises to strengthen the muscles that would be most used during my races. Core, calves, hamstrings, and quads. In pregnancy, I have done so many pelvic floor, back, and leg exercises! In half marathon training, I had to set small goals. Example: In the beginning I would set the goal to run 3 miles without stopping to walk. Then I would set a goal to run the 3 miles faster. Then I would set a goal to run further at a slower pace. You get the point. When I reached each goal, I would set a new one. In pregnancy, each week marks a new goal. Bumpdate to come after our check-up and ultrasound tomorrow.